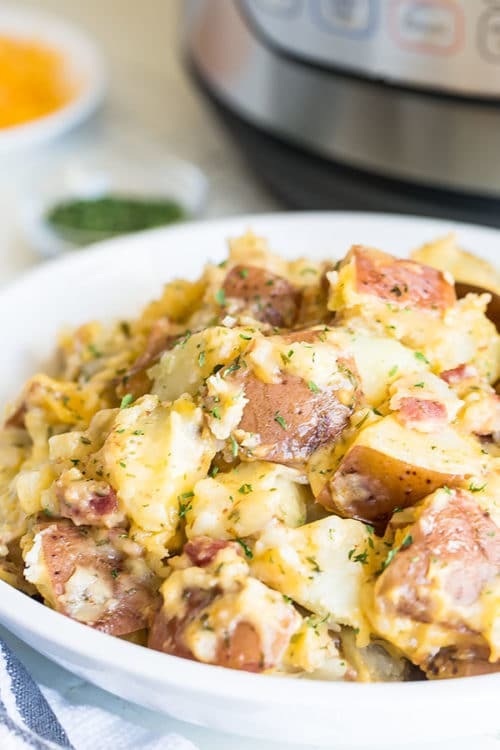 Cooking these cheesy bacon ranch potatoes in Instant Pot truly cuts down on cooking time, requiring only about 10 minutes of hands-on time. 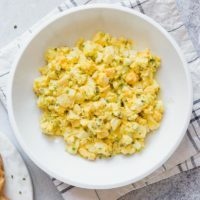 And with only 4 main ingredients, you know it’s going to be your favorite side dish to fix! And it’ll be a hit every time you serve it. 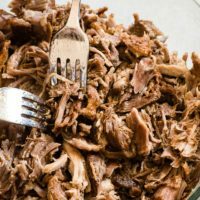 Electric pressure cooker, such as Instant Pot, really cuts down on cooking time when it comes to this delicious comfort side dish. 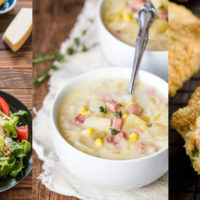 As you know regular baked ranch potatoes take at least an hour to bake, and slow cooker version requires an advance planning. 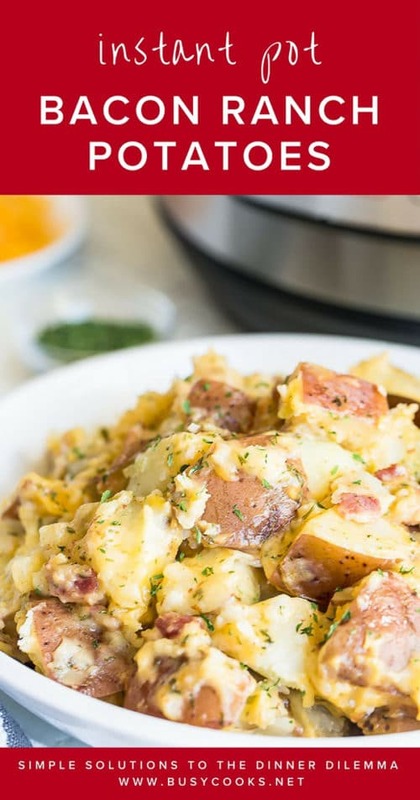 But with this recipe, you can decide to cook this potato side dish at the last minute, because it’ll be ready in less than 30 minutes, which includes the time for pressure cooker to come to pressure, mostly hands-off time. In my case, it took about 12 minutes to come to pressure. 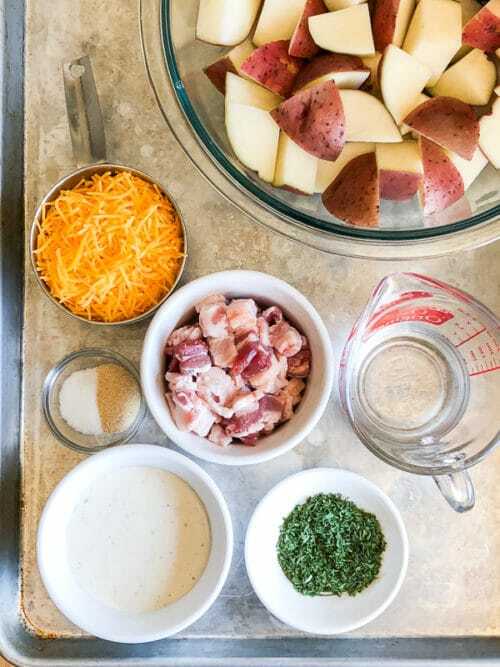 Only 4 simple main ingredients: potatoes, bacon, cheese and ranch dressing! I’m sure you’ll find these ingredients in your kitchen any given time! And you don’t need to peel them potatoes, just scrub it well, give rough chop and you’re good to go! If using pre-cooked bacon, I suggest adding about 1 tablespoon of oil or butter to compensate for bacon fat. And if you save your bacon fat in a jar, like I do, you can use that too! If using pre-cooked bacon, I suggest adding about 1 tablespoon of oil or butter to compensate for bacon fat. This recipe was fantastic! so easy to make, we loved it. Awesome, so glad you loved the recipe, Lori! Thank you for your feedback. Just came across this and oh my so good! 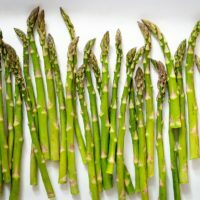 you say to add 1/4 if needed to deglaze and then the 1/3 water in the recipe – both? Thank You. Hi, Georgia. 1/4 cup of water is optional, and is not part of 1//3 cup of water that’s listed in the ingredient list. Does that make sense? Can this be easily doubled? Hi, Kelly. We haven’t tried doubling the recipe, so we can’t give a definitive advice. But let us know if you tried it. Thank you! My Daughter-in-law made these and we liked them so much she gave me the recipe. 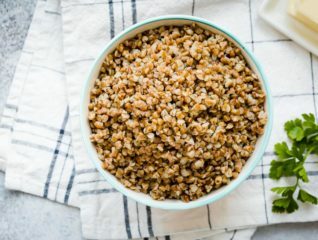 They are quick, easy and delicious! Awesome! So glad you all enjoyed it. Thank you for your feedback. 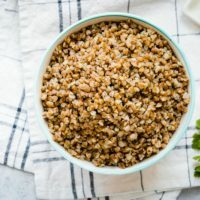 I definitely need to try this with my instant pot! It’s a must-try for sure, Toni. Hope you’ll love it. 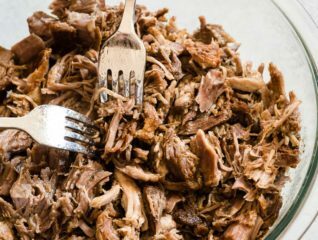 Donna, so happy you loved your very first Instant Pot meal! 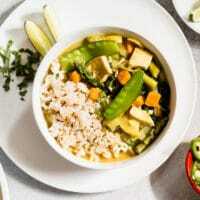 I do have a few delicious Instant Pot recipes here and more coming in the future too. Let me know if you try any of those recipes. And thank you for your feedback! 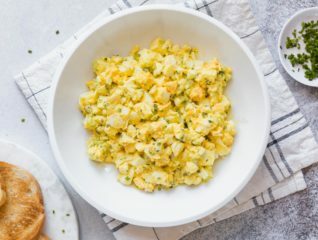 These potatoes look like the perfect cookout side dish! Absolutely! It’s easy to make and such a crowd-pleaser too. Thanks, Rebecca!